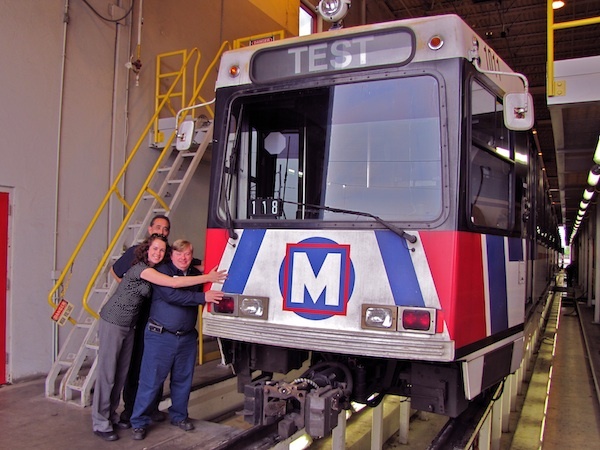 So why are Jamie Kenyon and Marc Cruz hugging a MetroLink train? Because light rail is something they love about St. Louis. The organization City Affair has put together an event asking participants to submit photos of them “hugging” what they love about St. Louis. The rules suggested the object of affection could be a place, a thing, even fellow St. Louisans. The idea was to encourage people to think about the positive and endearing aspects of St. Louis that we love and enjoy, even if they are not perfect. By being part of the GROUPHUG, St. Louisans are showing each other and the world what they cherish about our region. In a recent guest post for the blog Infrastructuralist, Peter Kageyama, author of “For the Love of Cities: The Love Affair Between People and their Places,” begged the question: why aren’t we building emotionally connected cities? Kageyama cites a recent Gallup study that found strong correlations between peoples’ emotional attachment to the communities they lived in, and higher levels of local Gross Domestic Product (GDP). When people felt more attached and positive about their city, it was reflected in the local economy. He suggests that when we love someone, we want to fight for them, and the same is true of our towns and cities. When we love our streetscapes, visit our parks, root for our sports teams and take our favorite bus home, we share an emotional connection with our sense of place. And emotional connection often translates into engagement – more active residents participating and improving our cities and neighborhoods. The same goes for our schools, our workplaces and our transit system. It is alright to desire change and improvement for the things you love about St. Louis, but we should build our community’s foundation out of love and affection. What would you hug in St. Louis? The GROUPHUG ST. LOUIS event is this Thursday if you want to find out what or whom are fellow St. Louisans showing some love. The documentary Saving Cities will also film interview attendees on community-level efforts to improve St. Louis. 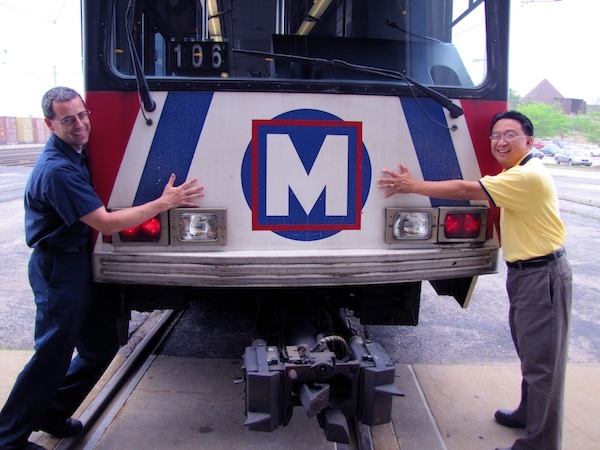 WHEN: Thursday, June 2, 2011 at 7 – 10 p.m.
St. Louis MetroLink exemplifies efficiency in all forms of the word. Instead of revamping our bus system, money needs to be invested in light rail because even though significantly more expensive, the long term pay off is infinitely more beneficial! The problem, of course, is that Metro doesn’t have two scheckles to rub together outside of their existing budget. Even using an existing rail right-of-way, such as the old Rock Island/TRRA right-of-way between Clayton and Westport, the bill for adding Metrolink is close to 1 billion dollars (that is billion, with a B). Metro simply doesn’t have the means (or, for that matter, the vision or the will) to put together that kind of cash. The battle for funding (as I know Courtney can tell you) is normally difficult, but in this economy it would be egregiously drawn out – assuming a potential source could even be found. I wouldn’t look for an extension of Metrolink in either of our lifetimes.